Foxtail palms or ‘Wodyetia bifurcata’ are used widely in landscaping, with trunks to nearly 10m when mature and showy displays of foliage that has the appearance of a ‘Foxtail’. Foxtail Palms are a hardy palm and prefer a well drained position. These trees are native to northern Australia, although they are very adaptable. It is the foliage that curves gracefully that give the plant its common name. For a palm tree that was not discovered until the late 1800s, its popularity around the world has risen quickly. Foxtail palms are popular with developers and landscapers. They will grow as far south as Melbourne and will do well it pots. Foxtail Palms are reasonably fast growing given appropriate conditions. Foxtail Palms prefer full sun to part shade and benefit from regular watering when young as well as the regular application of an appropriate fertilizer. Foxtail Palms are deep rooted and reasonably drought tolerant once established. Foxtail Palms are used widely in street plantings, as specimen trees and in group plantings. Foxtail Palms or ‘Wodyetia bifurcata’ are a very popular palm with landscapers. They are hardy and do well in a range of climates. 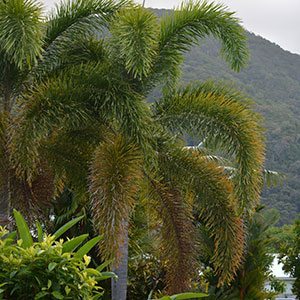 Used widely in landscaping foxtail palms are available as container grown trees to 4-5 m. Larger palms (ex ground stock) are also available for transplanting. This is a ‘self cleaning palm’ , which means it will naturally drop its old fronds, this eliminates the need for pruning. These are a plant with a deep root system, so watering needs to be slow to give the water time to sink well down into the ground. Shallow watering encourages the root system to the surface which is not desirable. Height – Will reach 10 metres over time. Growth rate – Regarded as fast in warm climates. Foliage – Arching mid to light green fronds. Trunk – smooth and self cleaning. Foxtail Palms are available from the following wholesale nurseries. 250mm – mature Rhapis Excelsa, and also Japanese Variegated Rhapis (mail order), wholesale and retail. Mondo, Liriope, Large Kentias, large Silver Ladies, Lillypilly Standards, Foxtails. Wholesale tropical assorted palms specialising in Foxtail Palms, 8-10″ pots 3-5′ high, sun hardened,excellent condition, ready to plant.